Looking for a luxury watch that is also capable of withstanding extreme water depth? The TAG Heuer Aquaracer Watch CAP2112.FT6028, developed by divers, is fashioned to be functional under extreme conditions as well as maintain the classic design of the TAG Heuer timepieces. 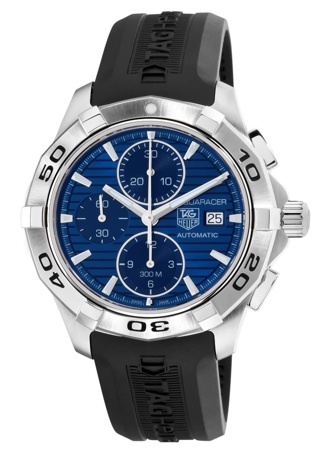 The TAG Heuer Aquaracer Watch CAP2112.FT6028 is comprised of a stainless steel case with a blue dial and a black rubber strap. The unidirectional bezel features the numbers 10 through 50 in black engraved into the stainless steel. The aquamarine blue dial has a navy strip pattern running horizontally across the background. Each hour is indicated by a polished stainless index and each minute is marked off. The hour, minute, and seconds hands are all luminous so that they are visible in the dark or underwater. 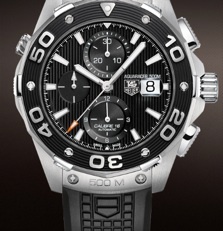 The date is to the left of the 3 index and is surrounded by the TAG Heuer label and watch name. There are also three chronograph functions at the 6, 9, and 12 o’clock positions. The rubber band also features the TAG Heuer name wrapping around it. 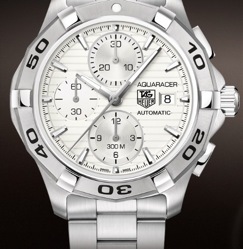 The Aquaracer Calibre 16 Automatic Chronograph 42 mm CAP2111.BA0833 has the same layout on the dial as the Aquaracer CAP2112.FT6028 but instead has a white dial and a stainless steel bracelet. The overall effect of the CAP2111.BA0833 is a more uniform piece without the contrast of the silver bezel, indexes, and hands to the dial and band. The Aquaracer 500 M Calibre 16 Automatic Chronograph 44 mm CAj2110.FT6023 is the ultimate diving watch of the collection with its water resistance to 500 M. All the features of this watch have been designed for diving use and take into consideration the necessary but often overlooked details; as an example, they have large studs on the bezel for easy manipulation with diving gloves. TAG Heuer initially created chronographs for automobiles and aircrafts before moving into sports timing. The Aquaracer line is an elegant collection of high-end timepieces designed by professional divers, which is a hearkens back to TAG Heuer’s involvement with scuba diving along with other extreme sports. The TAG Heuer Aquaracer Watch CAP2112.FT6028 is a durable timepiece that combines the brand’s superior history of precise timing and sports involvement with its classic style and clean design.